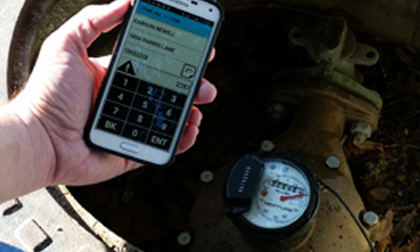 PLANO, TEXAS – Jan. 12, 2016 – SmartPhone Meter Reading, LLC (SPMR), a new provider of water, gas and electric meter reading solutions,announced today the first full-featured meter reading system for Android smartphones. The robust SPMR meter reading app eliminates the need for traditional and expensive handheld field computers that require extensive user training, complicated software updates and long-term service contracts. The SPMR meter reading app is compatible with Android-based smartphones and can be easily downloaded via a texted link. Using a smartphone’s GPS technology, the app captures the coordinates of reading activity, pinpointing the exact location. This helps resolve customer disputes, optimizes reader performance and aids in locating meters and other utility field assets. As a reader records each meter’s data, SPMR automatically uploads it in real-time via the phone’s cell data network or via WiFi. A photo of the meter or other on-premise issues can be associated with the reading record to resolve disputes and make better management decisions. All data is uploaded to a secure Cloud Server and can be accessed at any time by the SPMR web users via a password protected interface. The smartphone app can be remotely disabled in the event an employee leaves the company or loses a phone. For more information about the SPMR app or to request an online demo, visit www.smartphonemeterreading.com or call 214-540-5050. SmartPhone Meter Reading, LLC (SPMR) is based in Plano, Texas, with resources that tally more than 200 years of combined meter reading experience. Their innovative Android-based SmartPhone Meter Reading System was launched in January 2016. For more information visit www.smartphonemeterreading.com or contact Aaron Cook at ACook@TPRM.com or (214) 520-3430 x.306, www.tprm.com.